At Wise Street, LLC, our business is the Internet and how it can best be used to achieve the goals of our clients. We do this by listening to what you want to accomplish and by applying our sophisticated expertise to your specific needs to get you the results you want. We were founded by David Greenberg, an Internet marketing specialist since 2000, whose work has always been driven by a passion for doing the right thing for his clients. We are a dedicated group of highly skilled professionals, seamlessly working to reach your goals. We do not believe in a one-size-fits-all approach, nor do we plug you in to an automated solution and let the machine take over. We do not lock clients into contracts, because our philosophy is completely devoted to insuring that you are satisfied with our work and with the results we achieve. Instead, we tailor strategies to the unique needs of each client. We put your entire web presence under a microscope and we pay meticulous attention to all of the details that combine to make a clear, coherent and effective marketing strategy. Our participation in the global community of elite Internet marketing professionals helps us, and you, to stay well ahead of the curve. At Wise Street, we use powerful, effective tools that do the job you want done. We increase your traffic. Once we get people to your site, we help you interact with them effectively. We make your site user-friendly. We increase your conversion rate. We constantly reevaluate our progress and fine-tune our strategies to ensure that you are getting the results you want, turning searchers into visitors and visitors into customers. The result: you meet your goals. 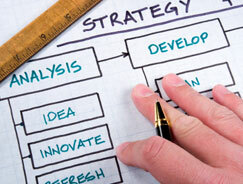 Our strategies cover all the bases, because we customize our solutions to meet your needs. We can help a business increase online sales or an organization increase memberships. We increase awareness of your cause if you are a non-profit and we see to it that your message makes an impact. If you offer a service, we make sure that potential clients find you and that your web presentation makes them want to work with you. We don’t rest on our laurels, either. The Internet is constantly evolving and so is Wise Street. If we think that catching the latest wave will benefit our clients, we’re all over it, whether it's the latest in social media or leveraging the potential of current and future mobile platforms. At Wise Street, we do not pull a veil of secrecy over our work. We want you to understand what we do and why we do it. If you would like an in-depth look at what we do, we explain many facets of our approach in the "What We Do" section of the site. We invite you to put our ideas to the test with a free consultation.